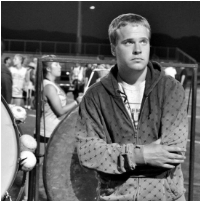 Austin Boyer is a front ensemble specialist, performer, and percussion instructor based in Bakersfield, CA. His drum corps experience includes two seasons (2010 and 2011) with the Santa Clara Vanguard Cadets from Santa Clara, CA. In 2012, he was a member of the world champion Blue Devils "A" Drum & Bugle Corps from Concord, CA. Austin is also active in the WGI Percussion activity and was a member of the Pulse organization from 2012 - 2014. In addition to his performance experience, he is a music coach in the Kern High School District where he has instructed at Ridgeview, Centennial, and North HS. Austin is currently a front ensemble tech for the Bakersfield College Indoor Line and the Golden Empire Drum & Bugle Corps.